Clarins put a fresh twist on its summer essentials to slip right in between your beach towel and sunscreen. This summer Clarins has a four piece Sunkissed Makeup Collection which includes a limited edition Bronzing Compact, 4-Colour All-in-One Pen, SOS Primer and a permanent Instant Light Lip Comfort Oil. The whole collection has a rather tropical vibe with Florida palm trees, sun-washed hues and flamingos, and will put you in a tropical state-of-mind. This will be my first time trying their summer collection and I must say I am very excited. Starting with the Bronzing Compact (CAD $42): It’s maxi-size caramel case decorated with pink flamingos and palms trees contains a harmony of 3 matte shades adapted to all skin tones. With its extracts of white tea and nipplewort, this bronzing powder gives a beautiful tan and help to protect the skin from the harmful effects of pollution and free radicals. Swirled together you get a beautiful natural bronze that is very soft with a natural glow. Pigment is light to medium but natural looking and for this one, the tones are close to my skin so it almost blends in with my skin. It will be subtle and light enough in color to give your skin a soft sunkissed glow. 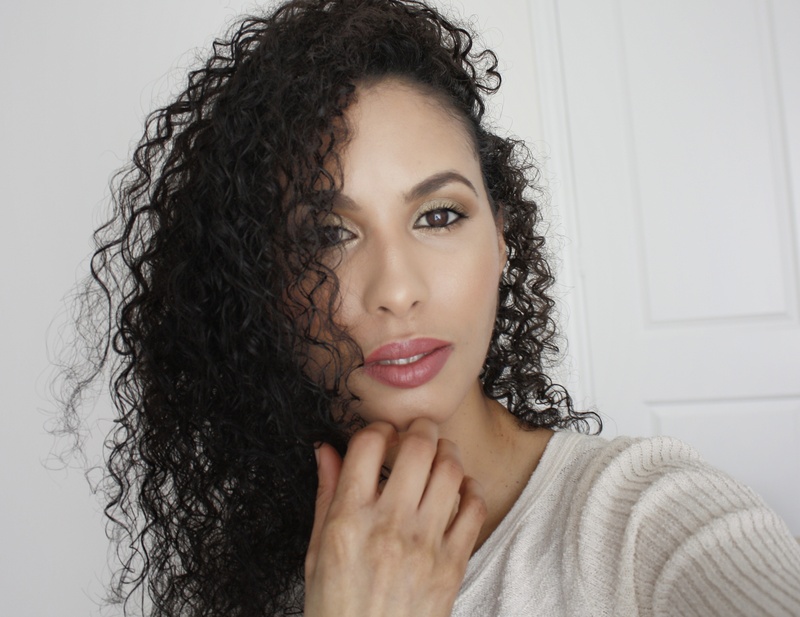 I have medium olive skin tone and the bronzer gives me the perfect sunkissed look. I like to use a large bronzer brush and lightly sweep all over the face for a natural glowing effect or apply on areas of the face the sun would naturally hit, such as cheeks, nose and chin. The different shades are easy to use and arranged in stripes, allowing you to tailor the finish. The texture is soft and glides on easily. I love the beautiful packaging on this. The 4-Color All-In-One Pen – Limited Edition (CAD $35): Clarins’ innovative all-in-one pen for eyes and lips is dressed for summer in emerald green and a Florida pink palm trees print. You can choose from an intense black liner for creating a deep, graphic look; an emerald green to highlight all eye colours and an intense plum to warm the eyes. There’s also a bright pink to line and define lips and prevent lipstick from bleeding, which can also be used on the eye contour. This is such a simple and innovative idea that manages to combine nostalgia with function, portability and ease of use. The formula is very nice and silky and won’t tug at your eyes and lips. All four shades are enriched with Black Acacia and Sunflower Wax Complex to comfort eyelids and lips. As well, the colors are all matte with a pigmented creamy formula and lasting power is pretty good on all of them. This is the only product you’ll need to carry in your purse this summer for your makeup touch-ups! Next are the SOS Primer (CAD $39): The new SOS primers are a favorite staple in my makeup routine and I’ll have a full review shortly on all 6 SOS Primers that were launched earlier this year. Clarins also released 2 additional limited-edition ones for this summer, specifically formulated to warm all skin tones. The “blur” effect textures instantly illuminate and correct the complexion, thanks to the High Lumitech Complex and correcting pigments. 07 Mocha is designed to provide luminosity and brighten dull complexion and also prolong makeup time. It blends easily into the skin and leaves the skin very hydrated and also provides a glowy look. The mocha is a bit dark for me but after a tan, it should work for me. Finally, the Instant Light Lip Comfort Oil (CAD $25): Clarins’ best-selling Instant Light Lip Comfort Oil welcomes a new member to the family. The only thing from the collection that will be permanent, this new shade in Blackberry will leave your lips with a glossy plum finish. This isn’t the shade I would have expected to be in a summer collection but it really ties in the whole look perfectly. I’ve raved about these Lip Oils here. Formulated with nourishing plant oils, this new Lip Comfort Oil has a delicious blackcurrant flavour. It also has hazelnut, organic jojoba and acai oils. This one is easy to apply, doesn’t migrate off the lips and is great for everyday wear. It isn’t tacky or sticky at all and it is just a great product for dry lips as it will protect and hydrate the lips. Overall this is a very summery collection indeed. My favorites from the collection are the Bronzer of course and the Lip Oil. The 4-Colour All-in-One Pen will be a hit or miss and I already love the SOS Primers, but I feel I will get better use out of this Mocha shade when I have a tan. Will you be picking up anything from the collection? Share with me in the comments below! You can find the Clarins Sunkissed Summer 2018 Makeup Collection now at The Bay, Shoppers Drug Mart and on clarins.com.